Sending all of you a copy of our Christmas card this year! Happy holiday's! That is hysterical!! Love it!! How cute, my daughter lost her two front teeth too and everyone keeps asking her if that is all she wants for Christmas. I am thinking she is hoping they will come in real soon. Merry Christmas, oh and I just love the stocking holders you made, you are one creative gal. Your son is darling. Yah, he might want to ask for 2 front teeth, hehe. Merry Christmas to your family. Doesn't he even know HOW adorable he is? You HAVE to frame that one, too. That photo is priceless! I love it! You have a very handsome son. CUTE~!! 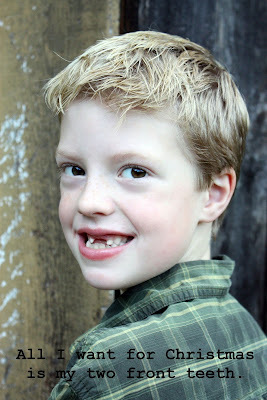 How often does the timing of your child's missing two front teeth work for the holiday card, LOL?! My son knocked his 2 front teeth out right before he started kindergarten! I did that for Christmas cards then too!! Cute! Did he plan this? HA!Ha!